Update: Please note that as of March 27. 2017 this fix is no longer required. If you are experiencing login issues, please contact contact.build@sap.com with your issue. We’ve noticed that some of our BUILD users have experienced the error message below when signing up for BUIID. This blog will show you a work around should you experience this error. 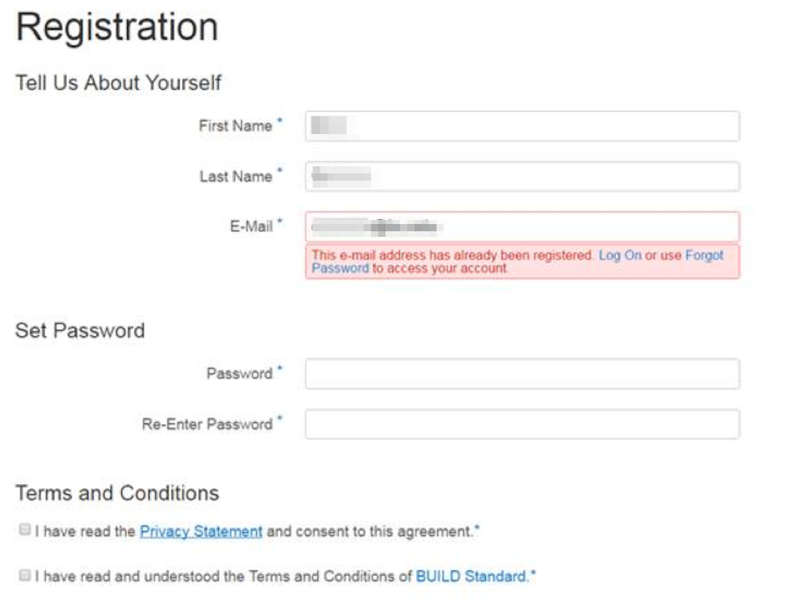 If this is your first time registering for BUILD, please ignore this message and continue the sign up process. (Set a password and agree to the Terms and Conditions. Then select “Register”.) At this time, the registration process will be complete. Please follow the instructions on screen, then ENJOY USING BUILD! *Note, if you believe you already have an account please select “forgot password”. This action will generate an email (sent to your registered address) with instructions on how to reset your password. If you do not receive this email, please follow the trouble shooting steps listed above. If you have any further questions or concerns, please reach out to us at contact.build@sap.com or find us on twitter @BuildwithBUILD.